She was 52, a mother and grandmother, a vendor of tamales. She lived quietly on the east side of the L.A. River, in an ugly stucco apartment house with concrete all around. Then one Sunday night, as she came home after delivering an order of tamales, she was attacked in the street, stabbed twice and left to die just steps from her home. She was found quickly, but it was too late for any aid. 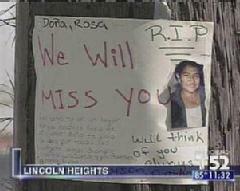 Doña Rosa died, and no one but the killer knew who had done it, or why. Oh, there were rumors, there always are, but for most people on her street, life went on just as it had, just without Doña Rosa’s tasty tamales or her soft smile. This is not a story from 1927. "Doña" Rosa Cruz, wife of Joel MejÃ­a, mother of Nancy, native of El Salvador, was murdered in Lincoln Heights on Sunday, July 22. As of today, this crime has received no coverage in the English language newspapers or broadcast media. It has not appeared on the LA Times’ Homicide Report Blog. Detectives were in the neighborhood yesterday, asking questions and looking for an answer. And on the corner of Albion and Avenue 20, the people who loved Doña Rosa continue to gather, bringing fresh flowers and seeking comfort in community, on the open sidewalk where she walked on that last night. On this blog we remember the forgotten dead from long ago, people who came to Los Angeles and found, not whatever improved life they were seeking, but too often an anonymous or notorious death. We should never forget that these people left families and loved ones, and that these crimes resonate in large ripples out over the decades, in those who knew the victim and far beyond. RIP Doña Rosa, and we hope peace can be found by those who loved her.